"One of my favorite places to visit in Bali and one of my wife�s least favorite places is Mandala Wisata Wenara Wana. 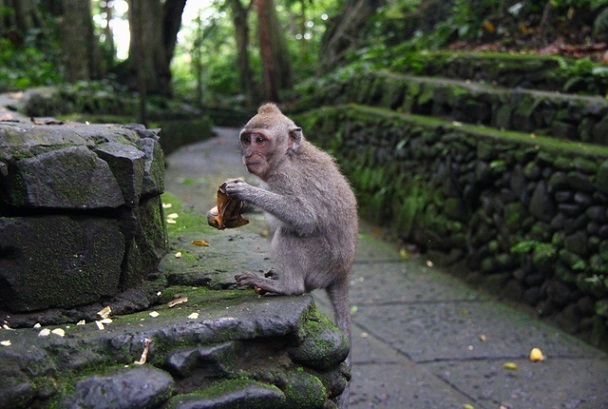 More commonly known as The Sacred Monkey Forest Sanctuary in Ubud. She has a slightly irrational fear of the mischievous simians but for most travelers and locals, a visit to The Sacred Monkey Forest is a fun one. Mind your shiny valuables and don't try to hide food in your pockets, but if you are aware of the potential pitfalls, the forest has much to offer." There are several "Monkey Forests" in Bali. They are called "monkey forests', or forest where monkeys live. Such as the "Sacred Monkey Forest" of Padangtegal (in Ubud), "Alas Kedaton Monkey Forest" (near Tabanan) and "Sangeh Monkey Forest" (at Sangeh). 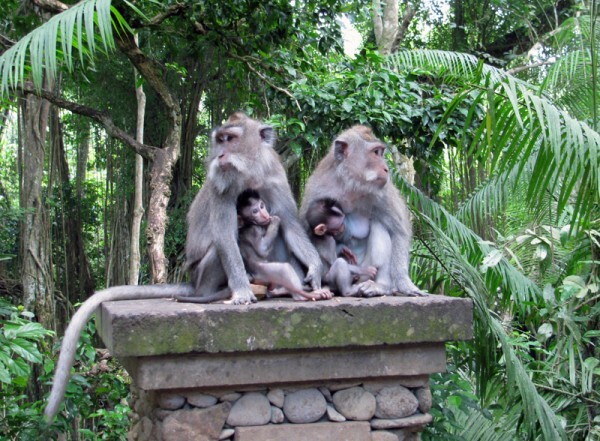 The Monkey Forest in Ubud is a protected area for three groups of rhesus monkeys. These are members of three different 'groups' or families. They are changing constantly the boundaries between the habitats of the families, it happens often that the monkeys are fighting about this. According to the managers of the Monkey Forest, this often leads to injuries with the monkeys, but almost never to the death. Because macaques are real forest animals, they usually remain in the Monkey Forest (and probably also because they are fed there). The forest is not locked so it happens sometimes that apes go to the villages or walk in the rice fields. In the sacred monkey forest, Mandala Wisata Wanara Wana, you can wander about. 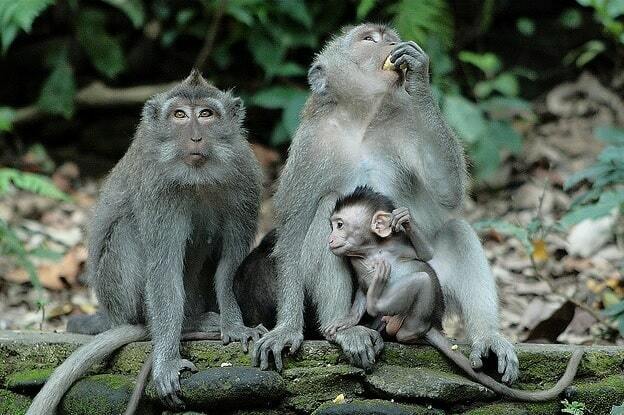 The forest is inhabited by more than 600 Balinese long-tailed macaques. The monkeys are generally pretty tame, and as long as you quietly do your own thing, they'll do that too. The monkeys in the Monkey Forest are used to the presence of people. They are not afraid of people, but visitors must be careful not to conflict with the monkeys. By touching, quick movements or direct eye contact with a monkey they can be aggressive, and sometimes they will bite. If you eat when you're in the forest, it is certainly stolen by the monkeys, without a doubt. But also other things, like wallets and cameras are sometimes stolen from curiosity by monkeys. The monkeys are petting and grooming each other, playing with each other and as said they fight. At the entrance of the forest food is sold, including bananas. But the staff of the park do not recommend to buy bananas and to feed them. Monkeys are wild animals after all, so it can be dangerous. So it's actually best to walk quietly without coming too close to the monkeys in the forest. Besides the monkeys, the forest is also worth a visit for the three temples built in the 14th century, which you find here. The Pura Dalem Agung is the biggest and the most important of the three temples. The second temple is the Pura Prajapati, the temple of the dead, which is used for burials and cremations. The third temple is the holy Bath Temple. It consists of three parts: one part for the gods, another for the disciples of the gods and the last part is a resort for the common people. Also, there are a large number of trees in the forest, which are sacred. Especially the "Pule Bandak" is an important tree. From this tree they make masks, which are used at ceremonies. For this, the tree is not cut down, but only a small part of the timber is taken off. Other species is the sacred "Majegan", which is used for making sacred sites, and the "Berigin", whose leaves are used in the main cremation ceremonies.